A Ramsgate Playground has been opened in memory of Alfie at the Sir Stanley Gray Thorley Tavern. Please click the below link to read the full story. The Alfie Gough Trust is delighted to announce that we have two new members joining our team! Zoe Ives and Mark Devine will be taking the role of Events Coordinator for The Alfie Gough Trust and Alfie’s Striders. 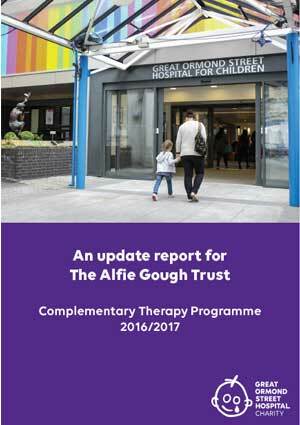 You can meet the members of the Alfie Gough Trust team by clicking here. Zoe and Mark have been with the charity since the beginning and have helped at many events starting from the days of the Hotel De Ville’s very first fun run for Alfie. Their support for both the charity and the run club is truly amazing and we are very much looking forward to them both stepping up into their new roles; which we are sure they will do a fantastic job in. Please join us in congratulating them on this new and exciting post. Now in our 5th year as an established registered charity in Kent, we are continuing to support and fund Jenni Hallman, Complementary Therapy Nurse Specialist (previously Alfie’s Nurse) at Great Ormond Street Hospital. 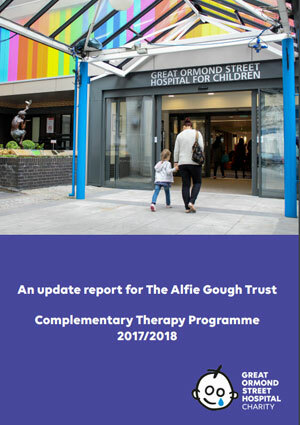 Please click here to open the report (.pdf) of what our charity has enabled her to achieve for patients in the past year. To view the previous report, please click here. Spending time in hospital can be a frightening experience. Meeting a stream of different health professionals, coping with high-tech machinery and undergoing treatment is often daunting, let alone getting to grips with the illness itself. Complementary therapies are being used more and more in hospitals alongside clinical treatment. The aim is to alleviate the symptoms of certain illnesses, while also helping with anxiety, fear, stress, pain management and sleeping problems. The Great Ormond Street complementary therapy program has been running since 2011 and relies solely on charitable funding. Children with cancer on our Lion, Elephant and Safari Day Care Wards now regularly use and have benefited from the introduction of this service which focusses on specialised massage therapies. Providing complementary therapies allows for dedicated time to alleviate some of the stresses that families face when they receive their child’s cancer diagnosis. It provides families with a chance to ask about the condition, side effects or to talk of their concerns about going home or their feelings about their diagnosis. Having a nurse-led rather than therapist-led role in the hospital means that the nurse is able to deal with these concerns and support the unique needs of the each child and their family. The Alfie Gough Trust was delighted to attend a wonderful morning of toddler time with so many children and the lovely Fiona. Fun was had by all at Helter Skelter Broadstairs. Raising a massive £215 Thank you to Fiona and her team for the continued support and all the families who came along and took part. 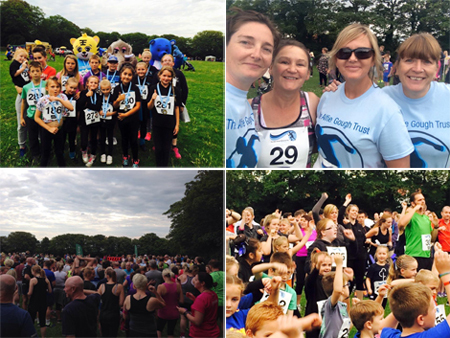 The Alfie Gough Memorial run took part on 29th July at King George VI Park. The run held under UK athletics rules consisted of a 10K, 5K and a children’s race around the park. Over 230 runners took part in the 5 & 10K. The evening begun with a family warm up led by motiv8 Sports and then straight in to the fun run with 80 children who raced around the park all receiving a medal. Many runners from various running clubs joined for the evening to take part in the grueling route which contains many hills , all enjoyed the challenge of this route with some impressive times being achieved. The event was kindly sponsored by Thorley Taverns and Ramsgate Town Council with Goody Bags provided from ASDA Broadstairs and London Array. Many local businesses also joined to support the event. The planning of this run led to the creation of a new running club for Thanet – ‘Alfie’s Striders’. The group have been meeting at 10am on Sunday’s at King George VI Park and 7PM Wednesday evenings from the Government Acre Ramsgate providing each week running coaching sessions free for anyone to join at all abilities. The group continues to grow each week and always welcomes new members please contact via Alfie’s Striders Facebook page. Now in the 4th year as fully established registered charity in Kent The Alfie Gough Trust founded by parents Dean and Sarah Gough after loosing their son Alfie at 2 years old to Neuroblastoma. They have continued to raise money helping other families with children suffering from Cancer and other serious illnesses. 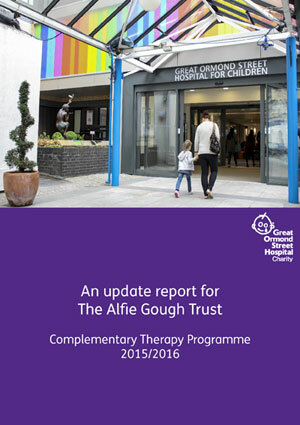 The charity is now funding a complementary therapy program at Great Ormond Street Hospital. The trust will fund the Complementary Therapy Nurse Specialist over the next three years at Great Ormond Street Hospital. Sarah Gough Said “we were delighted with the warm and friendly atmosphere in the evening and we hope to hold this each year in memory of our baby boy raising funds to help others”.